Eggsy’s Latest Adventure is Showing Some Serious Cracks. 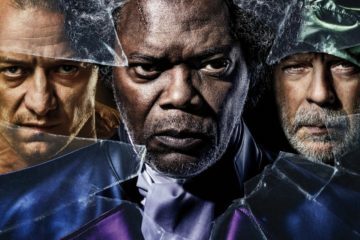 Matthew Vaughn’s take on 2014’s Kingsman: The Secret Service was a surprisingly fun take on Marvel’s comic book source material by creators Mark Millar and Dave Gibbons. 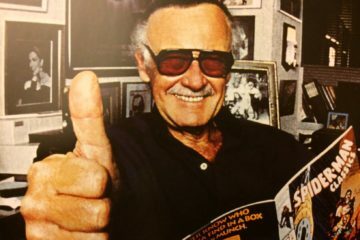 In my February 2015 review of that film, I ended my commentary with this line: “When all is said and done, Marvel could find itself with an R-rated hit on its hands that could actually lead to more installments…and that, could be a great thing.” Needless to say, Kingsman: The Secret Service was a hit, and 3 years later, we finally get a chance to see the sequel, Kingsman: The Golden Circle. Kingsman: The Golden Circle, and its bloated run-time of nearly 2 ½ hours felt like an unoriginal slog that learned all the wrong lessons from the success of the first film, and replicated the aspects of the original hit that had nothing to do with why people connected with it in the first place. Writer/Director Matthew Vaughn, along with previous Kingsman writer, Jane Goldman, are back picking up right where the first installment left off. 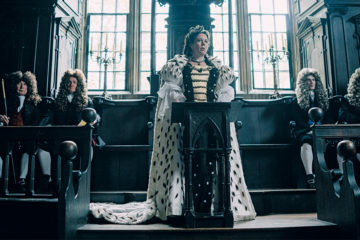 Eggsy (Taron Egerton), or codename Galahad, is seeking to balance his life as a Kingsman, and his still burning passion with Princess Tilde (Hanna Alström) whom he saved in the 2014 film. When failed Kingsman recruit Charlie (Edward Holcroft) shows up with an all-new robotic arm and a team of assassins to kidnap Eggsy, the action begins. 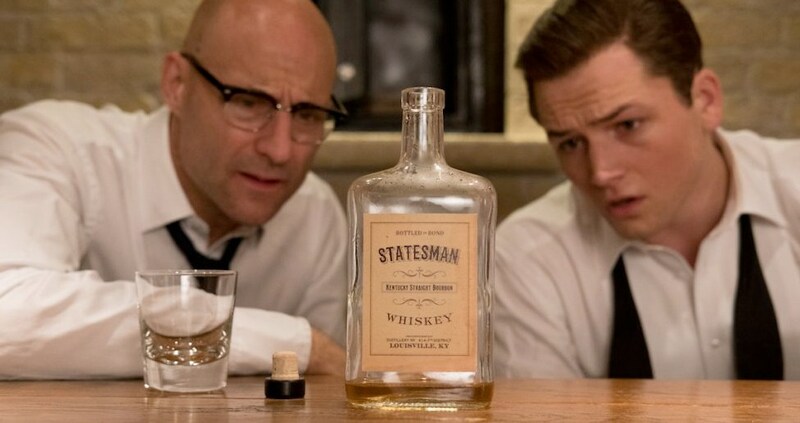 Through this encounter, Eggsy and Merlin (Mark Strong) find themselves surviving a devastating attack on the entire Kingsman network, causing them to enact the never used ‘Doomsday Scenario’ which leads them to their similar and allied secret-service-like stateside agency, called ‘The Statesmen”, in Kentucky. Instead of a cover making suits, The Statesman run a whiskey distillery, and are headed by a man named Champaign (Jeff Bridges) with agents Tequila (Channing Tatum), Whiskey (Pedro Pascal-whose character, Whiskey, humorously looks like a take on Norm Macdonald’s impersonation of Burt Reynolds), and Ginger (Halle Berry). There, Eggsy and Merlin will discover the existence of a powerful drug cartel named The Golden Circle headed by Poppy (Julianne Moore), another over-the-top villain with a panache for all things 1950’s Americana…and Elton John. They will also learn that the original Galahad (Colin Firth) has survived his bullet shot through the eye, but is not quite the same agent they remember. 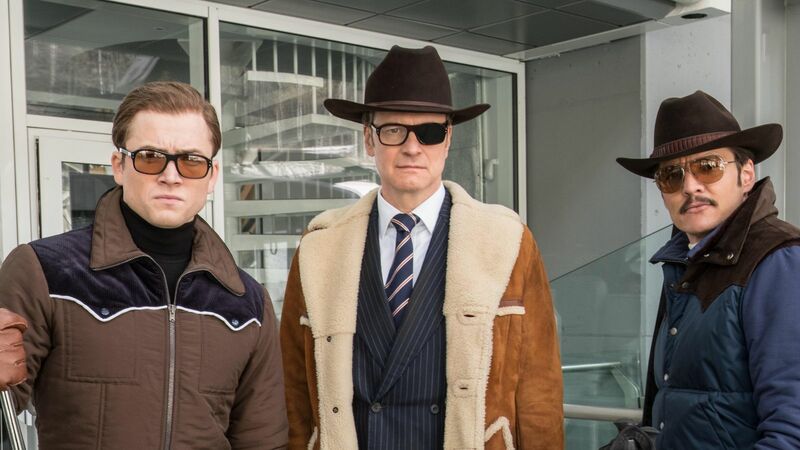 When Poppy’s evil plan threatens the very world Eggsy has been trying to balance, The Kingsman and The Statesman join forces to bring her down. On the face of things, this sequel should be a no-brainer runaway hit. 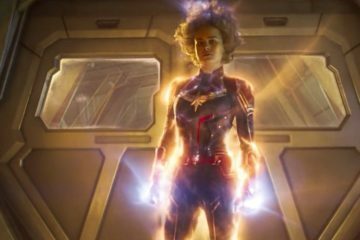 It reunites the cast, director, and writers from the first film, and adds the likes of heavy-hitters Julianne Moore, Jeff Bridges, Channing Tatum, and Halle Berry, and brings back fan-favorite Colin Firth. 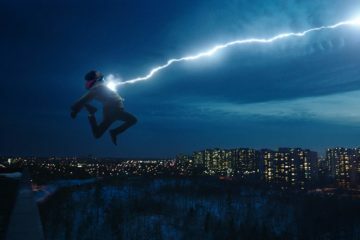 It has action, comedy, overly violent sequences, ridiculous arch-villians who take themselves very serious yet allowing us not to, and everything else that seemed to work well in the original film 3 years ago. For some reason, however, Kingsman: The Golden Circle, and its bloated run-time of nearly 2 ½ hours felt like an unoriginal slog that learned all the wrong lessons from the success of the first film, and replicated the aspects of the original hit that had nothing to do with why people connected with it in the first place. The danger of doing something so well, is that you are forever living in the shadow that the original work casts, no matter how much you seek to replicate the success of it, while also being wholly original. Some have done it, like Edgar Wright with his Cornetto Trilogy or this year’s Baby Driver, but it can be a daunting task. The Kingsman story naturally lends itself to being an installment franchise like fellow British spy James Bond is, but after extremely diminishing returns in this sequel, I now have to wonder if they should have kept Kingsman: The Secret Service as a one-off. At this point, they’d do well to quickly make the third installment and wash the bitter taste out of my mouth without some of The Statesman’s whiskey, so that we can get back to this being a proper British super-secret spy agency. What the studio obviously learned from the original is just to be violent for its own sake, and simply swap out the aspects of the villains in the first film and upsize them for this one, without providing any of the charm and originality that made it work in the first place. Examples? Take Charlie, with his robotic arm serving as a cheap fascimilie for Sophia Boutella’s “blade-runner” prosthetic legs of the original. Instead of Samuel L. Jackson’s and his obsession with burgers from McDonald’s, despite being a billionaire, we now have Julianne Moore’s 1950’s-styled diners serving her own version of a burger. 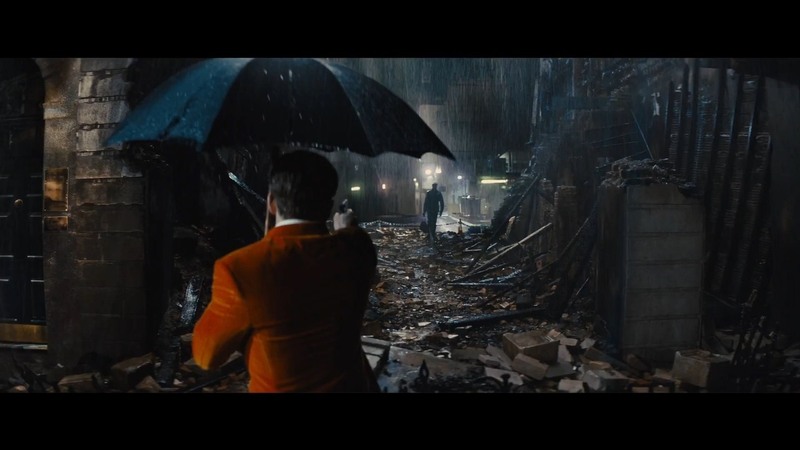 Action set pieces in the original film mattered, either to test the recruits’ meddle if they were worthy to be a Kingsman, or to teach what it was to still be a gentleman (in the bar fight scene with Firth for example) even though one has had trouble in life and is now a trained assassin. Here, action is simply provided to give the illusion of movement, even when we find that like a treadmill, we aren’t really going anywhere. 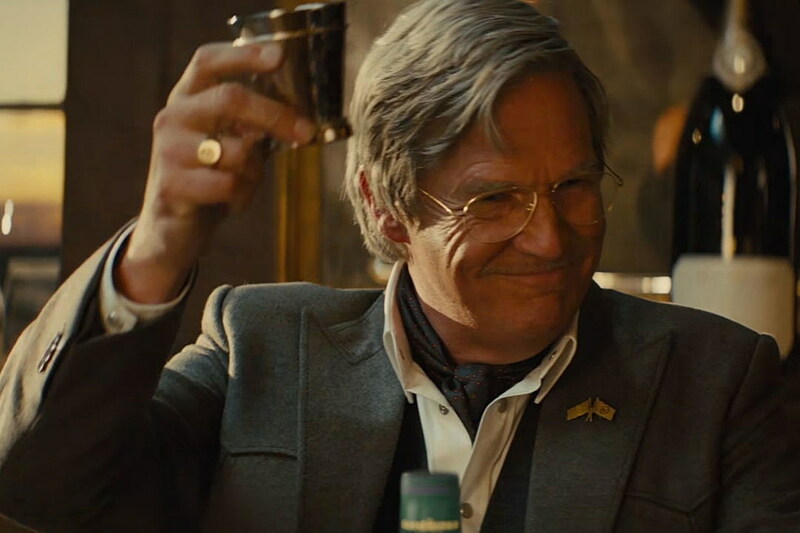 Kingsman: The Golden Circle has reduced both Jeff Bridges and Julianne Moore, who previously teamed up in the equally disappointing Seventh Son, to having Bridges rival his awful R.I.P.D. role by here occupying empty space by being just a stateside replacement cameo for the greatly missing Michael Caine (who played Arthur in the first film and was replaced as Arthur in this film by Michael Gambon who has a habit of being the “replacement Brit”, having previously replaced the late Richard Harris as Albus Dumbledore in the Harry Potter Series). 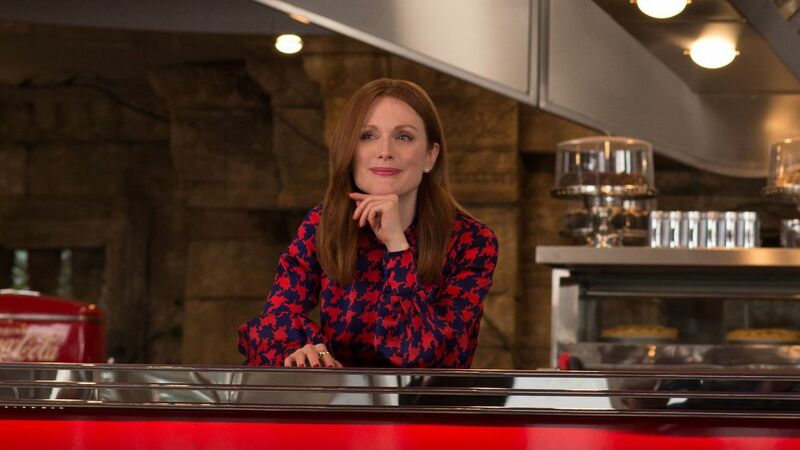 For Julianne Moore, she is given very little to work with here. Its actually embarrassing. Other than a very promising opening featuring a deliciously entertaining, yet stomach-turning, introduction to her character, she simply comes off as weird vs. the eccentrically entertaining Samuel L. Jackson role of Valentine in Kingsman: The Secret Service. Channing Tatum is given a couple of fun moments, but is largely wasted in a really frozen performance (wait to see the film for that joke). He is, however, given the opportunity to further his emerging John Denver trilogy of 2017 (IS it a real-thing?) following Logan Lucky (If Edgar Wright can have a blood and ice cream, or Cornetto, trilogy based on a single brand of dessert popping up in each film, then this John Denver trilogy IS a thing). Instead, Tatum is saved for the hinted at third installment. 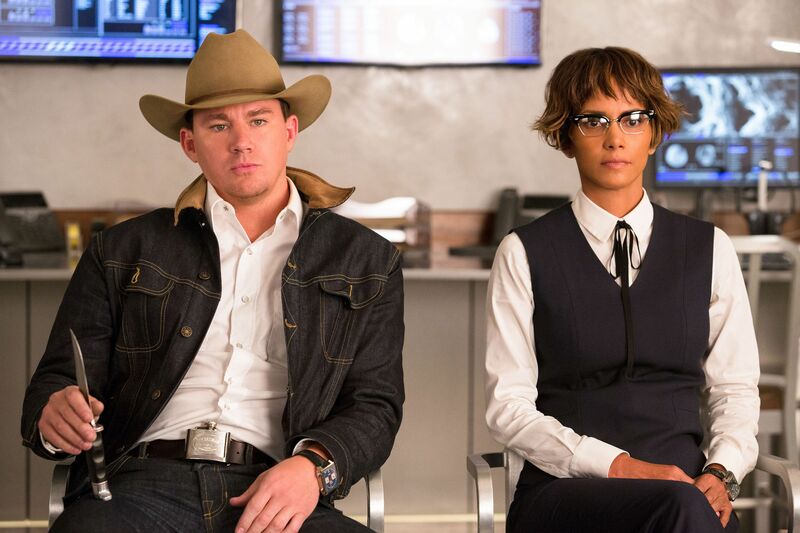 Halle Berry continues her streak as having the worst film career since winning an Academy Award than any other actor in recent memory. This is not to say that there is nothing to praise here. Every once in a while, Vaughn finds the heart of the original film and shoots it directly into the vein of this one, providing some fun, yet short-lived, moments and even some laughs. It is when things are going well that it makes the overall film’s disappointments all the more noticeable. There is also an over-concerted effort to shoehorn “cool” references like ‘Instagram’, or ‘Glastonbury’ and hashtagging Poppy’s visible blue-vein drug effects, on those partaking in the drug culture, with its own hashtag, #BlueRash, to try to court some stereotype of millennials. Besides, it won’t be long for any of those references to feel very dated in the not-so-distant future. 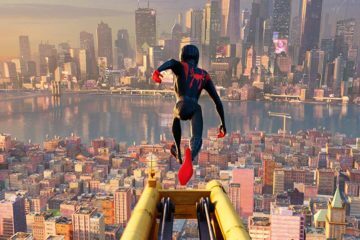 Vaughn should realize that the first film worked because it knew that it was ridiculous and had a blast celebrating exactly that with a retro-level of fun delivered with a modern asthetic. When you have to force the jokes, and especially the “cool” factor, you either misunderstood what you did 3 years ago, or its a sure sign that this became just another corporate money-making tentpole franchise that no longer exists to be fun or irreverent, but is now being built with a certain amount of “strategery” (thanks Will Ferrell’s George W. Bush for the word) to ensure old-fashioned profit. Nothing is wrong with success and profit, but at least follow the late John Houseman’s advice and accomplish it the old-fashioned way by “earning it”. 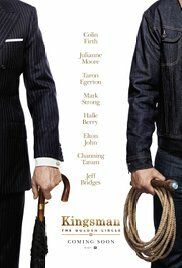 Instead, Kingsman: The Golden Circle accomplishes none of the promise that existed when we walked out of the theater 3 years ago. In 2014 I stated that more installments of the Kingsman were welcomed. It’s 2017, and I think I just might regret that wish. My 2014 wish has now come full (golden) circle in some ways where I now have another chance to state my thoughts on this series. 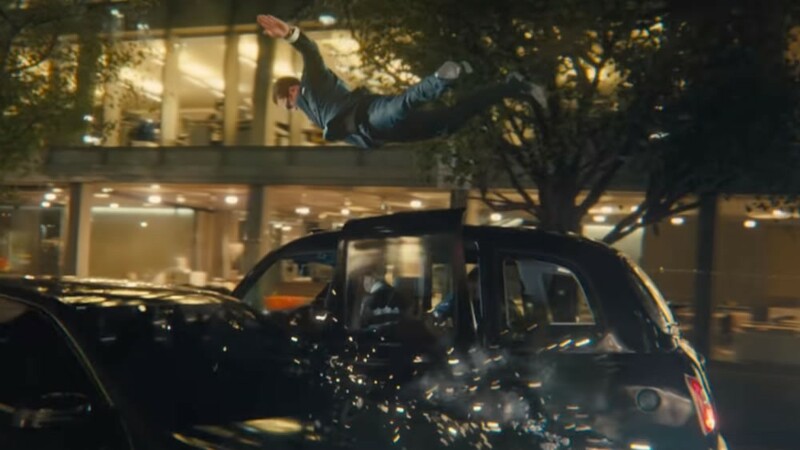 Matthew Vaughn might agree with me already, since we have seen that he has decided to literally and figuratively blow-up the Kingsman, both the fictional agency and the series, along with nearly every plot thread he left dangling in the original film that was meant to lay the foundation for future adventures. The result of the British identity of this once promising spy series being torched for financial expediency in order to introduce a more American-centric spy story has stolen the heart of the film I liked in 2014, and has left me with nothing to show for it, after a 3-year wait and a 2 1/2 hour run-time, but one of Poppy’s #BlueRash.